Free Run? Free Range? Organic? What’s the difference? Local reporter Erin Shaw produced the following video segment on the different kinds of eggs that are available to consumers. The video does an excellent job of actually showing the difference between the living conditions diet and housing for hens on Caged, Free Run, Free Range and Organic Farms. 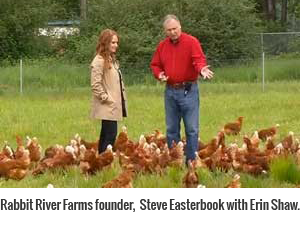 Rabbit River Farms is featured as the Organic Farm. How Exactly do Chickens Lay Eggs?